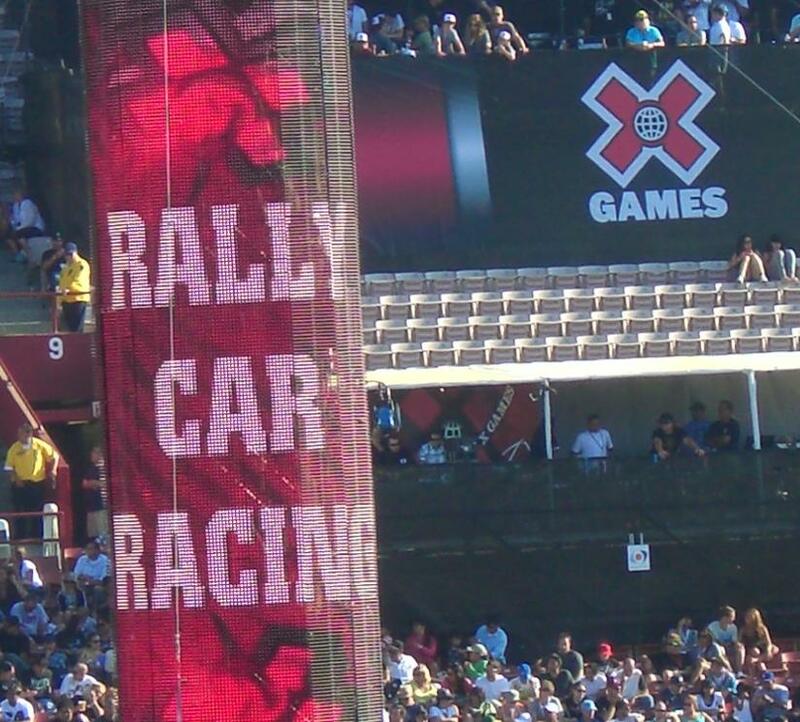 X Games 16: “Rally Car Racing” and “Super Rally” | What in the World Rally? I remember the very first running of the rally event in 2006. It seemed that the only spectators in the Home Depot Center were curious looky-loos drawn by the sound of engines. Even in 2007, I was able to hang around the service area long enough to eavesdrop on a drivers’ debrief, while everyone else was watching the skateboarders. Gone are those days. Travis Pastrana reigns supreme over a nation of adrenaline junkies. Ken Block rules the neighboring kingdom of You Tube, with a notable diplomatic visit to Top Gear. 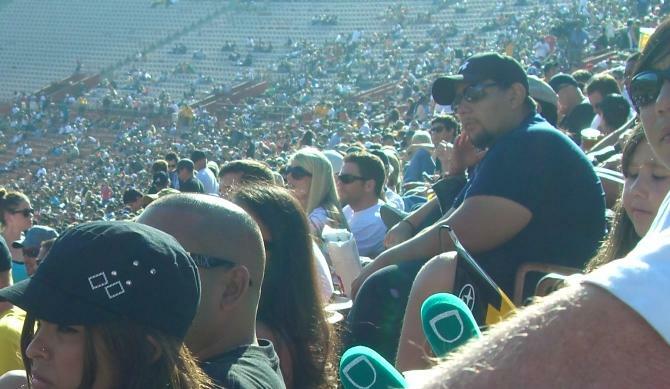 The crowd in the Coliseum today? Tens of thousands! I would have been annoyed with all the crowds if I wasn’t utterly amazed by how rallying has exploded. Not only are the fans out in numbers–they’re dedicated. Ken Block shirts, 199 tattoos, Subaru Rally Team USA hats–these aren’t just looky-loos anymore. The guy behind me was even up to date on Rally Finland (which I’m waiting to see on HD Theater next weekend, so don’t give away who won!). Because you can find a recap of the exact proceedings elsewhere, I won’t get into it. Anyway, it was really hard making sense of all the action from the stands. All I know for sure is that Tanner Foust won two, very well-deserved gold medals. Cars jumped, and people liked it. Three cars jumped at once, and people loved it. A car rolled, and people screamed. Then all mayhem ensued–donuts, jumps, running over foam barriers–and the crowd went wild! However, despite all the good news, the rallying was marred by poor organization. From the confusion over the course, to the rallycross final that ended one lap early, the organizers need to impose the same decorum that the FIA bestows on the World Rally Championship. In fact, they should call up Marcus Grönholm (he’s not busy, right? ), lure him over with a crate of ketchup, ask him to consult on the rulebook, and then push him into a car and order him to drive! Perfect plan. I’m also frustrated at the lack of professionalism by the drivers. Even without co-drivers, they should have been able to find their way around one stage. An itty-bitty one, at that. There’s no panacea to this problem, but as the fan base expands, so does our talent pool. So if you’ve got any talent at all, get off your bum and get in a car! That’s how all the best rally drivers got started. Even Seb Loeb used to slum it up in a Citroen Saxo. Back to the X Games: the rallycross event was a huge success. In fact, with the super special stage being such an underwhelming mess, it might be a good idea to make a full transition and drop the traditional rally format. As much as I love rallying, the very nature of a three-day time trial is not spectacular enough to entrench itself into American sports culture. Rallycross, however, has amazing potential. NASCAR on dirt? It’s something we can relate to. One can tune in for the first time and know what’s going on. That’s how the future looks, in my humble opinion. And until Ken Block wins a WRC event, that’s the way it will be. fact wass a amusement account it. Look advanced to far added agreeable from you! May 13, 2014 at 11:44 pm. Permalink.